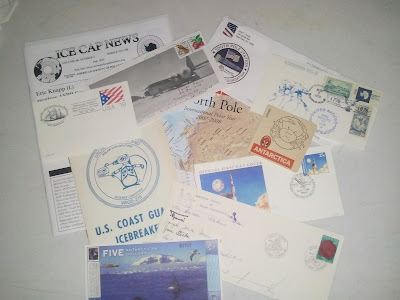 On Friday, I received my welcome letter from the American Society of Polar Philatelists (ASPP) and was pleasantly surprised to find in addition to the most recent issue of the Ice Cap News, an envelope filled with polar philatelic items and other polar-related memorabilia. The following day, I received a welcome letter from the ASPP president and yet another polar cover. I've got to give a big thumbs up to the club I just joined. For the $22 annual membership fee, I also receive a quarterly subscription to the Ice Cap News and can purchase other ASPP publications. I've already found value in the Ice Cap News since it listed the station address of several polar stations where I can send my own SASE to be mailed home from the poles! I'm really looking forward to exploring what other benefits my new membership will afford me.